The vacuum producer is a ten horsepower, regenerative pump and the system includes electrical control box, suction relief valve, primary cyclonic dirt separation canister and secondary fine particle filter canister. 3-4 users with up to 80 inlet valves. Max pipe run of 400 ft. Movie Theaters, Office buildings, Movie theaters, Hotels, etc The 10hp power pump can be used for general cleaning by multiple users at the same time. This commercial systems can be used in a variety of applications including; office buildings, hotels, and more. 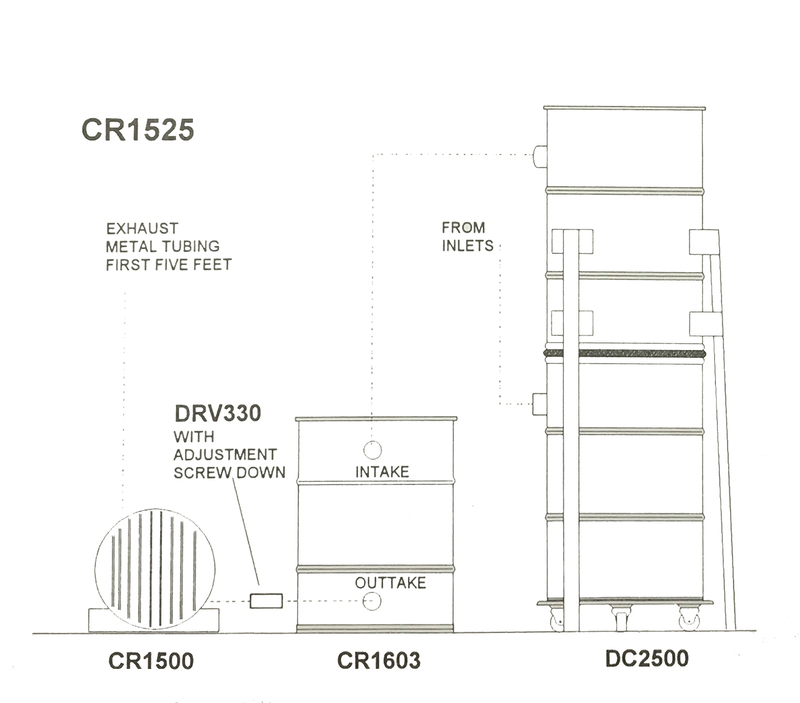 The CR1525 comes with a primary and secondary filter. The DC2530 is the primary filter and the DC1603 is the secondary filter. *Includes 10hp pump, dirt cans, control box and relief valve. Typical VacuMaid Systems include a number of outlets in the facility to be cleaned at a ratio of one inlet for every 700 square foot of floor space. Using standard 30 ft. hoses, valves are placed approximately 46 feet apart. The Power Unit is located some distance away from the area cleaned and provides quiet, powerful suction to remove dirt and debris from the area cleaned. The vacuum producer is a ten horsepower, regenerative pump and the system includes electrical control box, suction relief valve, primary cyclonic dirt separation canister and secondary fine particle filter canister. Sealed Suction 125” H2o in two inch line. Regenerative Suction Pumps cannot be allowed to run sealed, without a minimum of 150 CFM or the fan may be damaged. Relief comes pre-set from the factory. Installers shall test the valve according to the installation manual and confirm correct operation and suction relief. 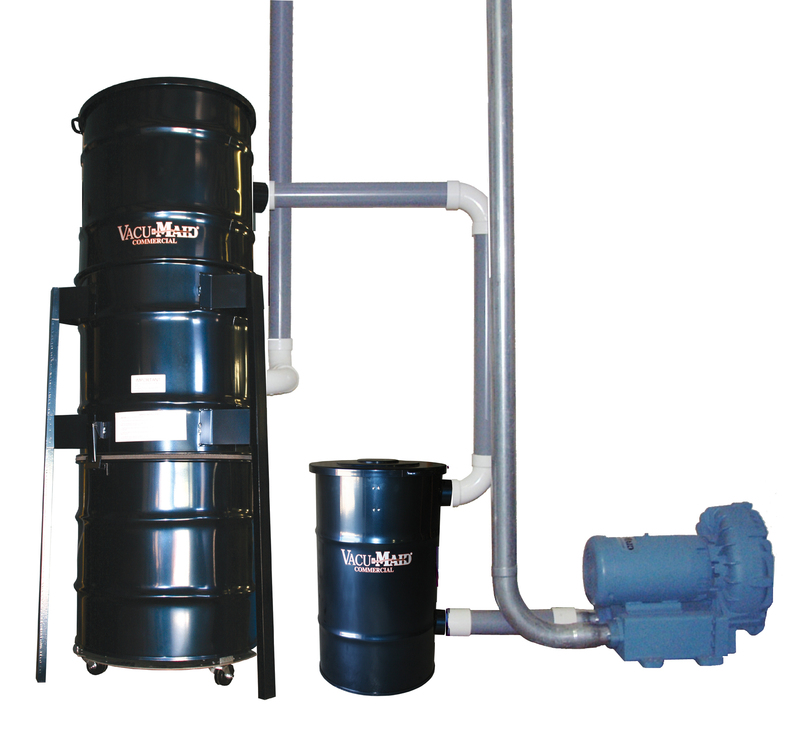 The VacuMaid power unit system should be installed in area with ventilation and a solid cement floor. The unit must be exhausted to the outside with 3-1/2” metal piping not to exceed 20 ft in length. Area should be large enough for mounting of the suction relief valve and servicing the two dirt canisters. CP1500 control box should be mounted on a wall close to the pump. Electrical Service of the chosen voltage is fed into the control box. 24 Volt remote control wires from intake piping system are fed into the control box. VacuMaid recommends steel pipe for commercial systems. The length of the valve stem. Steel pipe couplings and fittings should be connected with “PlioBond” brand cement. VacuMaid Commercial Systems have a 24 volt on/off remote control system incorporated into the electrical control box. All inlet valves have a microswitch to control the on/off function. Switch is closed when the hose cuff is inserted into the inlet valve. Common or Plenum Rated 18/2 multi strand wiring is used. 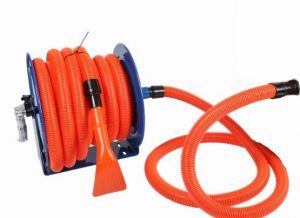 Hose should be commercial grade 1-1/2” OD with a soft cuff on the valve end and curved steel end for the cleaning end. 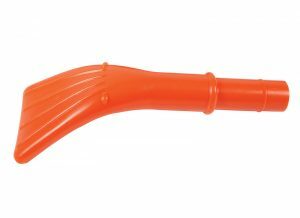 Curved hose wand on cleaning end has 1-1/4” diameter. Commercial grade, 1/1/4” Floor Tool, Carpet Tool, Duster Brush, Upholstery Tool, Crevice Tool. All central vacuum systems are dependent upon a correct and proper installation. Lindsay Mfg Inc can recommend competent and experienced sub-contractors for this work. Shipping Weight (Approx. ): ……………………………………………….. 300 lbs. 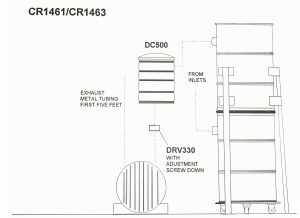 Inlet and Outlet Connections: …………………………………………. 3-1/2″O.D. Capacity (Approx. ): ……………………………………………………………………… 30.0 Gal. Shipping weight (Approx. ): ……………………………………………….. 265 lbs. Filtration: …………………… High efficiency reusable bag filter. Inlet and Outlet Connections: ………………………………………… 3-1/2″ O.D. Filter Area (Approx. ): …………………………………………………… 7.5 Sq. Ft. Shipping Weight (Approx. ): …………………………………………………. 60 lbs.